3 years ago, SharePoint Apps were a development topic. 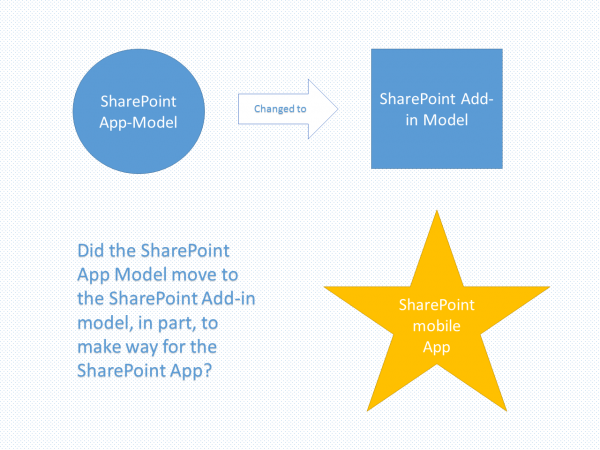 Last year, the “app model” name was changed to the “add-in model.” May 4th, 2016, with the announcement of “the SharePoint mobile app,” last year’s change seems more appropriate. I’ve always thought “the app model” suggested mobile app development. The change to “the add-in model” has been kind of hard to explain to developers. Whether or not the change in name was necessary to introduce the SharePoint mobile app, the mobile app fills a big hole for SharePoint. The SharePoint Product Team has been busy publishing new material this week. Make sure to read the Future of SharePoint event’s main follow up blog post, The Future of SharePoint. Most of the announcements are summarized in that blog, and the mobile app roadmap is documented. Read the blog post and watch the video which both cover more than just the SharePoint app. Are you excited about the mobile app? Personally, I couldn’t have been more excited to hear about the SharePoint mobile app. A mobile app from Microsoft, exclusively focused on SharePoint, is something I’ve thought was missing for a very long time. I know I’m not the only one.